25 Squadron Hughes 500E ? FFA AS.202 Bravo ? 1983 1988 Germany? The main marking is displayed in 6 positions (i.e. above and below each wing, and on each side of the fuselage) on aircraft – but on the fuselage sides only on helicopters. The fin flash is displayed on the tailfin. Aircraft do not carry service titles. This page gives details of some of the aircraft types that were offered or promised to the Royal Jordanian Air Force but not delivered, cancelled official orders, and types have been falsely reported as being in service. Three BK-117s are reported to have been in RJAF service. The Cherokees were actually operated by the Royal Jordanian Air Academy, not the Air Force. The Senecas were actually operated by the Royal Jordanian Air Academy, not the Air Force. Six(!) of the 25 Sealands built in total are sometimes reported to have been used by the RJAF. In 1923, after taking over the League of Nations mandate for Transjordan, the British established a military security force manned by local Arabs called the Arabs Legion. This force fought very successfully in World War Two. After the Israeli War of Independence, a small air unit called the Arab Legion Air Force (ALAF) was established in 1949 – largely manned by British personnel. In 1950 the training of Arab personnel began. The ALAF soon expanded and in 1955 received its first jet aircraft. In September 1955 the ALAF was renamed the Royal Jordanian Air Force. Take delivery of 2 Ilyushin Il-76MF freighters. A batch of six locally assembled Kamov Ka-226 helicopters is on order. The Jordanian military serial numbering system consists of a three or four digit mumber, e.g. 840 for a Hunter FGA.73A and 314 for an Alouette III. Serials are not reused once a type has been retired. The RJAF is organised into two commands, Operations Command for combat, transport and reconnaissance units and Training Command for primary and basic flying training. There is also a Special Operations Aviation Brigade, which appears to operate independently of the normal command structure. The main air bases currently used are Al Jafr, Al Mafraq, Amman-Marka IAP, El Azraq, H5 and Zarqa. In addition to the main bases, here are also a number of smaller airports and airfields around the country which are sometimes used by the Air Force. Jordanian Military Aviation Bibliography – to be added. In July 1956 the Arab Legion was separated into distinct army and police elements. The police element was known as the Public Security Force (PSF). During the period of martial law from April 1957, the police were again placed under army control. In July 1958 the PSF was reestablished as a civilian force. The PSF reported to the Public Security Directorate of the Ministry of the Interior. A Public Security Air Wing was established in 1989, with the arrival of the first helicopters. The helicopters are flown by Air Force crews on behalf of the Police. In January 2008, Jordan set up a Gendarmerie force using various elements drawn from the Public Security Directorate, including the Air Wing. The new force comes under the control of the General Directorate of Gendarmerie (GDG). 1958 Public Security Force established. 1989 First helicopters delivered – Air Wing created. 16 Jan 2008 Gendarmerie established. The Air Wing is primarily involved in security and paramilitary duties. Prior to the creation of the Gendarmerie, JPSAW helicopters displayed the PSD insignia on the fuselage sides. The national flag was carried as a fin flash. POLICE service titles were also displayed. Gendarmerie markings are not known. The Air Wing serialling system comprises a two-figure number for each airframe, prefixed by the letter P, e.g. P-07. All aircraft are based at Al Matar Air Base, Marka. All helicopters are operated from Al Matar Air Base, Marka. The King of Jordan has used transport aircraft operated by the RJAF since at least 1958. By the 1970s however, the Royal Family had started using civilian aircraft. 19?? Jordanian Royal Flight first established. Jordanian Royal Flight aircraft are flown under contract to the royal family. The main operator is Royal Jordanian Airlines. Jordanian Royal Flight aircraft fly in the colours of Royal Jordanian Airlines. The country title THE HASHEMITE KINGDOM OF JORDAN is displayed on the fuselage in English on the starboard side and in Arabic script on the port side. Royal Flight fixed-wing aircraft normally carry civilian registrations in the JY-Hxx series. The helicopters appear to carry two-digit serial numbers, e.g 02 for an S-70A-11. Lockheed L.1011 TriStar 500 1 1984 2001 ? All aircraft were based at Amman-Marka International Airport. All aircraft are now based at Amman-Marka International Airport. The Jordanian Government has had its own aircraft, separate from the Royal Flight, since at least 1978. 1978? 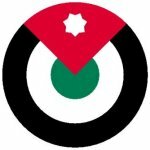 Jordanian Government Aviation Unit first established. Jordanian Government aircraft are flown under contract to the government by commercial airlines and business jet operators. Operators used include Arab Wings. Jordanian Government aircraft fly in mainly white colour scheme, with a fuselage cheatline in the national colours. A golden crown appears on the fin. The country title THE HASHEMITE KINGDOM OF JORDAN is displayed on the fuselage in English on the starboard side and in Arabic script on the port side. Most government aircraft carry civilian registrations in the JY-Axx series, although some have out-of-sequence registrations such as JY-ONE, JY-TWO etc.